I'm just sitting over here in my little corner enjoying all the comments and traffic that will most likely be gone after the contest is over! What a fragile little ego I have. Oh well. Enjoy it while you got it, I say! I sort of loved having so many comments in my giveaway post, and had a hard time realizing most people would never come back. I'm still here, and reading to my heart's content! It will be a harsh reality check, that's for sure. But I'm so glad that you're still here hanging out with us ticopi! Newcomers are always welcome! And encouraged to comment to help the aforementioned ego! 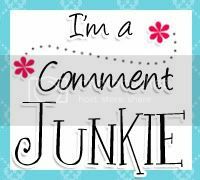 I'm still reading and will keep commenting! I finally set up bloglines so hopefully weeks won't pass without me reading and commenting. Then again I start work next week so that might still happen. I promise to e-mail you later today and tell you all that's been going on here.